Starting from System Center Virtual Machine Manager 2012 SP1, the web-portal isn't included in System Center Virtual Machine Manager installation disk. 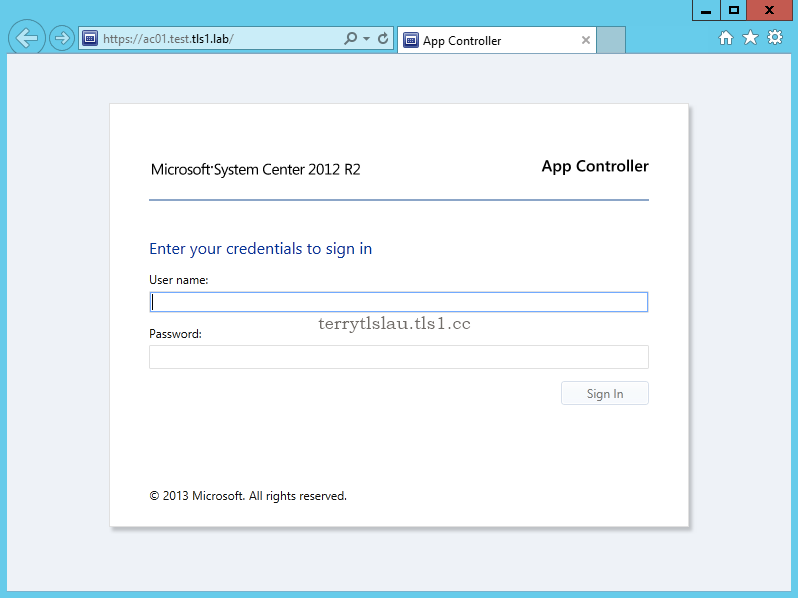 To use web-portal, administrators need to install System Center App Controller. App Controller allows administrators to configure, deploy and manage virtual machines and services across private and public clouds. Before installing App Controller, administrators need to assign "sysadmin" right to an account which will be install App Controller. 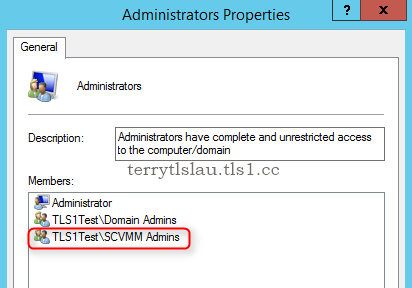 In this lab, VMMAdmin is under SCVMM Admins domain group. 3. On "Connect to Server" window, click "Connect". 4. 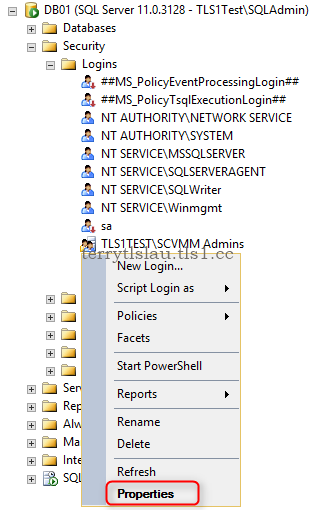 Expand "Security > Logins", right-click "TLS1Test\SCVMM Admins", select "Properties". 5. On "Login Properties" window, select "Server Roles". 6. Next to "Server roles", check "sysadmin". 1. On AC01, log in as Domain Administrator. 5. 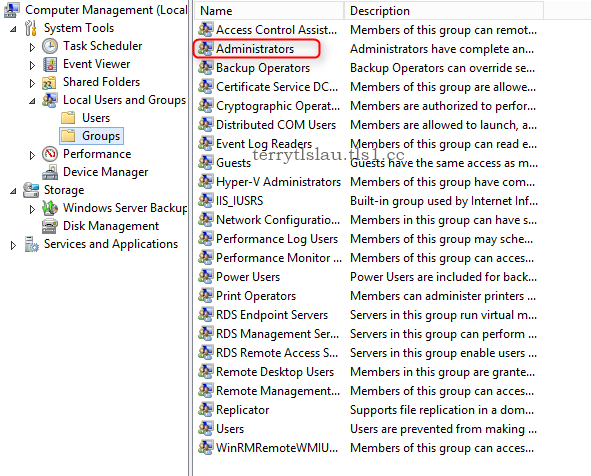 On "Administrators Properties" window, add "SCVMM Admins" group. Before installing App Controller server, Administrators need to install SCVMM console in an App Controller server. 1. On AC01, log in as VMMAdmin. 2. 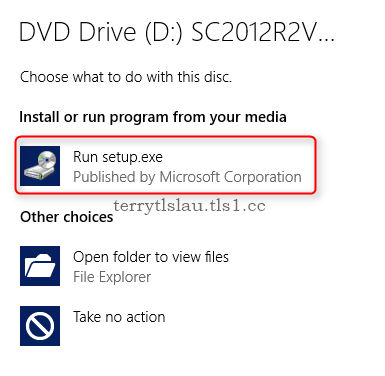 Insert "System Center Virtual Machine Manager 2012 R2" installation disk. 4. 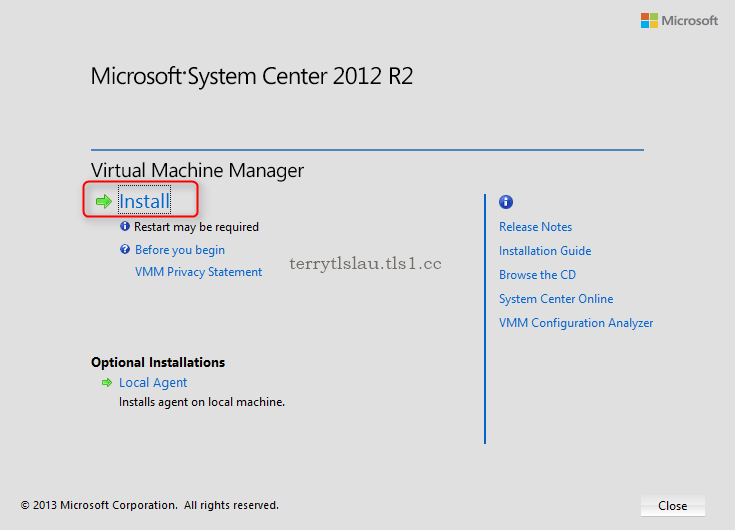 On "Microsoft System Center Virtual Machine Manager 2012 R2" menu, click "Install". 5. 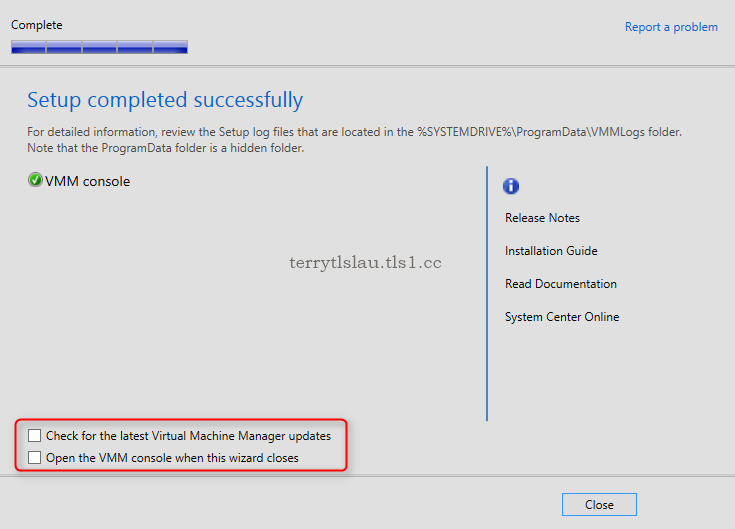 On "Select features to install" window, check "VMM console". 7. 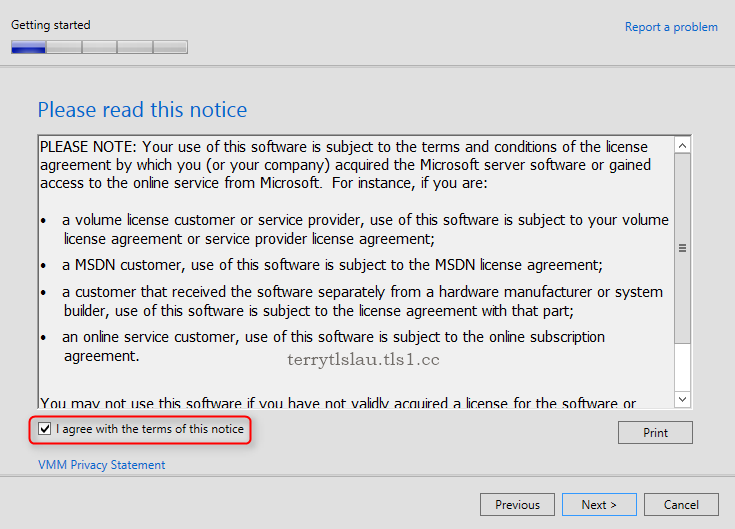 On "Please read this notice" window, check "I agree with the terms of this notice". 9. On "Customer Experience Improvement Program (CEIP)" window, click "Next". 10. On "Microsoft Update" window, select "On (recommended)". 12. On "Installation location", leave default path, click "Next". 13. On "Port configuration" window. leave default port number, click "Next". 14. On "Installation summary" window, click "Install". 15. On "Setup completed successfully" window, un-check all options, click "Close". 16. 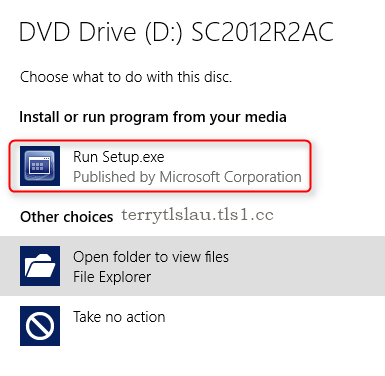 Insert "System Center App Controller 2012 R2" installation disk. 18. 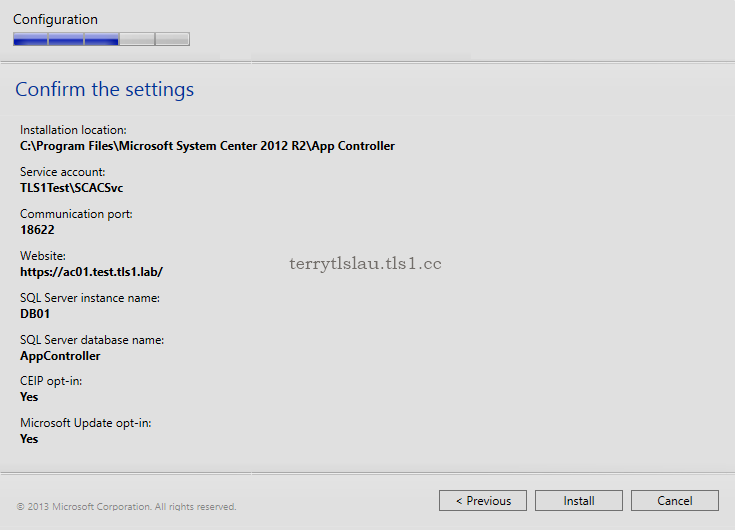 On "Microsoft System Center App Controller 2012 R2" menu, click "Install". 19. On "Enter your product registration information" window, click "Next". 20. 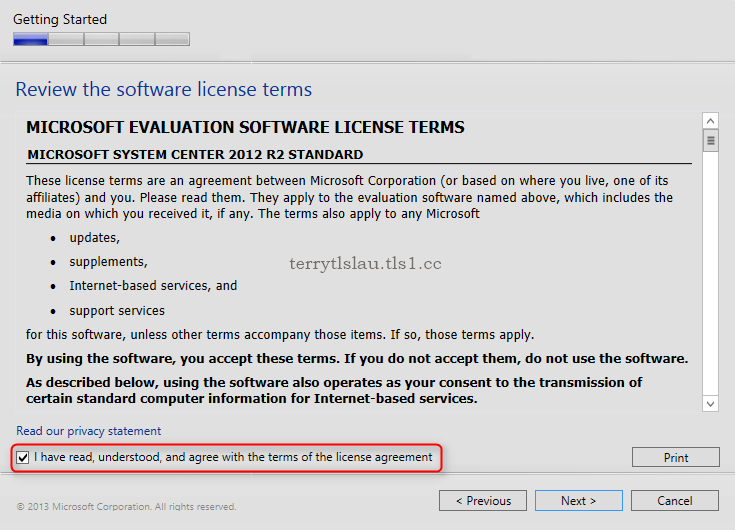 On "Review the software license terms" window, check "I have read, understood, and agree with the terms of the license agreement". 22. On "Install missing software" window, click "Install". 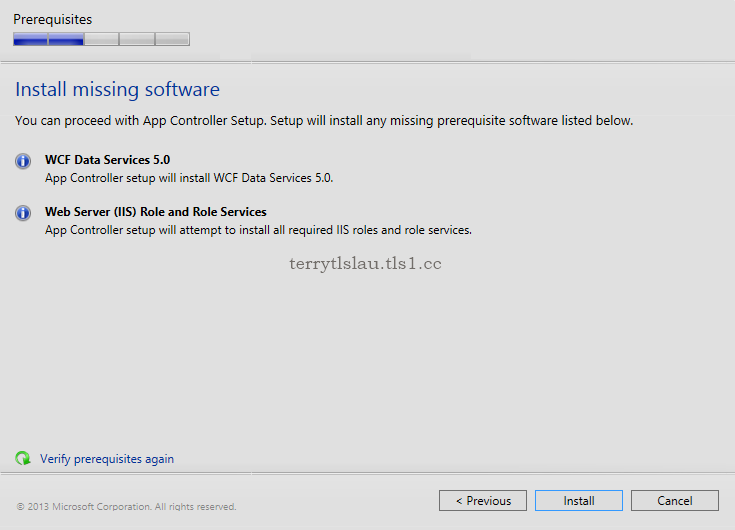 App Controller requires the "WCF Data Services 5.0" and "Web Server (IIS) Role and Role Services". The wizard will install it automatically. 23. On "Select the installation path" window, click "Next". 24. 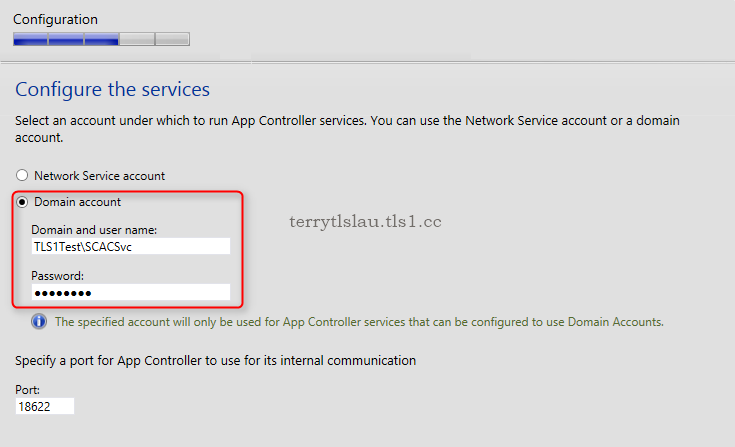 On "Configure the services" window, select "Domain account". 25. Under "Domain and user name", enter "TLS1Test\SCACSvc". 26. Next to "Password", enter the password of "TLS1Test\SCACSvc". 28. On "Configure the website" window, select "Generate self-signed certificate". For lab environment, I selected "Generate self-signed certificate" option. For production or HA environment of App Controller servers, administrators should use a certificate which is signed from Trusted Root Certification Authorities. 30. 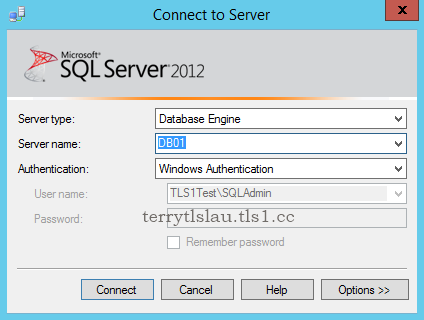 On "Configure the SQL Server database" window, next to "Server name", enter "DB01". 31. Next to "Port", enter "1433". 32. Next to "Instance name", enter "MSSQLSERVER". 34. 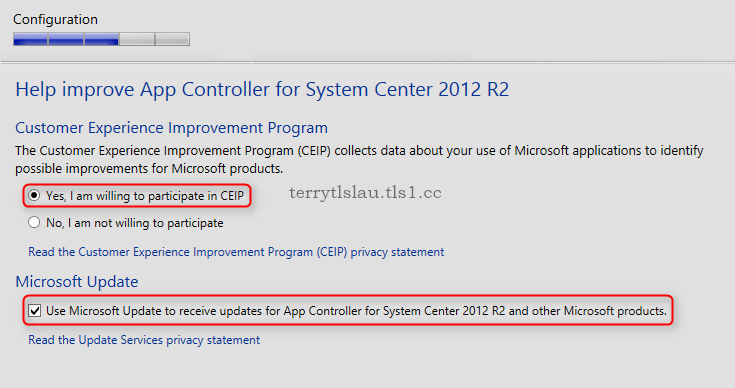 On "Help improve App Controller for System Center 2012 R2" window, select "Yes, I am willing to participate in CEIP". 35. 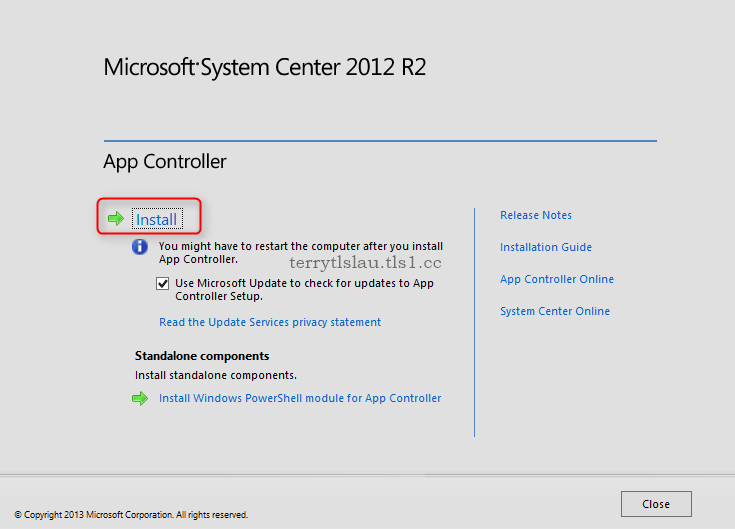 Check "Use Microsoft Update to receive updates for App Controller for System Center 2012 R2 and other Microsoft products". 37. On "Confirm the settings" window, click "Install". 38. 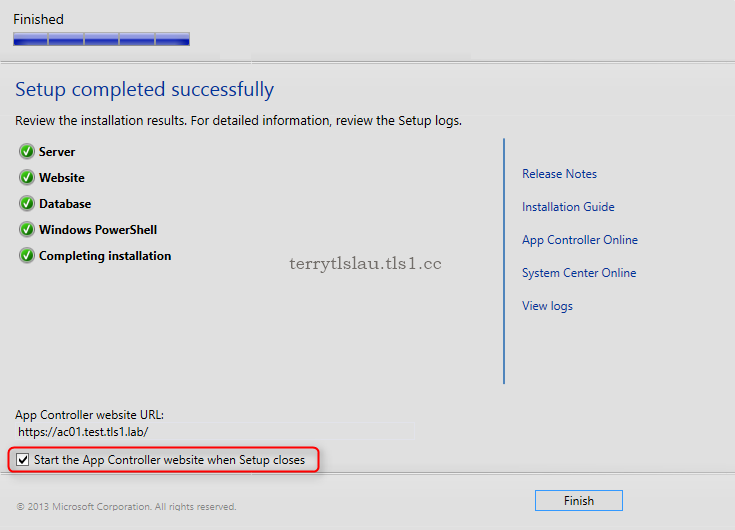 When installation completed, check "Start the App Controller website when Setup closes", click "Finish". As a result, App Controller is functioning.